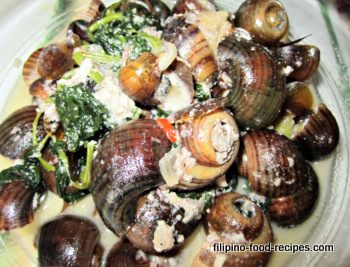 Every time a dish with Kuhol or snails is mentioned in Filipino cooking, a ginataan or a coconut cream sauce is the first one that comes to mind. It is not an ingredient as common as shrimp or squids, and not everyone is a fan of it. Let's talk about preparing the snail for cooking. The shell has to be thoroughly scrubbed and rinsed clean, otherwise any grit will land with your creamy sauce. The pointy spiral shell is punctured with the knife to be able to get the meat once it is cooked. Finally, the snails are cooked briefly, like how you would shrimps, clams or mussels, otherwise they will be rubbery and tough. 1 Saute the garlic, onion and ginger in a little oil, then add the shrimp paste. 2 Add the coconut milk and simmer to reduce to half and concentrate the flavor. 3 Stir in the snails, and the chili peppers and bring to a boil. 4 Pour in the coconut cream and cook for another 3-4 minutes. 5 Add the water spinach and season to taste.